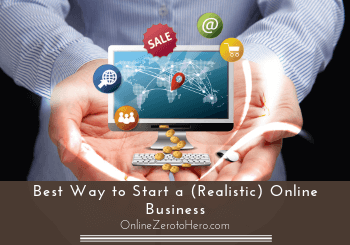 So you are interested in starting an online business – great idea! I did this a few years ago myself, and have gone through a tough research and learning phase to find the best way. In this article I will share my experiences with you and show you what in my experience is the best way to start an online business. Not only the best way but also the cheapest way – I will actually even show you a free option, where you can get started without taking out your credit card. It is a REALISTIC way I am going to show you and not one of those get-rich-quick schemes that is not going to work anyway. I think there are many good reasons to start an online business – you probably already have your own reasons for wanting to start online. One of the things an online business can give you is a lot of freedom. You can work from wherever you want, and you can work when you want to. This gives a lot of freedom in terms of planning your own schedule, and you are your own boss. You can plan your time, so you can travel and spend time with friends and family when you want to. This sounds appealing to most of us, and the reasons above were also why I myself started to look into this possibility back in 2016. However, this kind of freedom also comes with a lot of responsibility, and it is therefore not for everyone. So let’s go over some of the things you have to consider to find out if it is right for you. Can anyone create a successful online business? I just mentioned that creating an online business is not for everyone. However, I truly believe that anyone can create a successful business online. But not everyone is willing to do what it takes, and therefore not everyone will succeed. 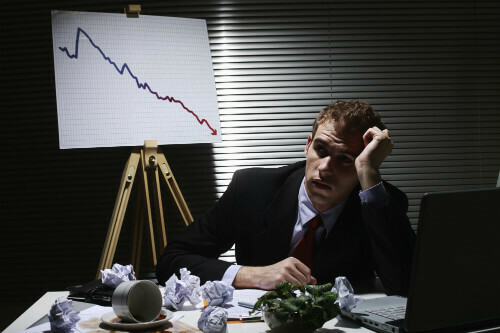 In fact, it is reported that 90% of all online startups fail – this is a scary statistic. But do not let it scare you – it does not have to be you that fail. Most people fail in online business – do not let it be you. The reason so many people fail is not because there are not enough opportunities online. There definitely is amazing opportunities and they seem to keep growing. You do not actually need a business background to succeed online. You also do not need a clear idea about what kind of business you want to start. This can be learned, and you can learn to create an online business built on your passion, as I will show you later. You do however need to be realistic and willing to do the work it takes. So let’s just take a reality check before moving on to the best way to get started. Realty check before you start! There are many reasons people fail online, and the statistic can seem scary. One of the big reasons is unrealistic expectations and impatience. Everything moves very fast online, and we have been led to believe that making money online and creating an online business should be easy and something that can happen more or less overnight. One of the reasons for this is that we often see these ridiculous claims about how automatic systems can make you rich in just a few days online. Claims like this gives us unrealistic expectations about creating an online business. Many of us therefore expect this and look for systems that can do this – it is just not realistic, and if you buy into systems with claims like this, you will instead end up wasting a lot of money and time. People that go into it with this kind of expectations and without being willing to work for it will fail. When they find out it actually takes work and effort, they will give up. I have seen this happen MANY times. Not only from people that expected to become rich automatically – it is obvious why they will quickly give up. But also from people who said they were willing to make an effort. They did just not realize exactly what that meant. I have see people putting in maybe 1-3 hours per week, and after 4 months concluded that this whole online business thing obviously does not work and felt cheated. It does work and it CAN work for you. But if you are new to online business and have never made money online before, there will of course be a learning curve. That goes for everything in life, and also when it comes to starting an online business. The more you put in, the more you get out. So it is important to go into it with realistic expectations and be willing to put in time and effort – it is impossible to say exactly how much time and effort, as this depends on the route you are taking. But you should expect to at least give it 6-12 months of hard work, if you have no previous experience. Personally I think it is worth all the effort, but it is a personal choice of course. It is possible to make it happen, but you have to be willing to make it happen. When first starting out, the cost of getting started is of course very important. Many people that start an online business still have a regular job and bills to pay, so the costs need to be kept down. This is where an online business has huge advantages compared to starting a regular brick and mortar business. 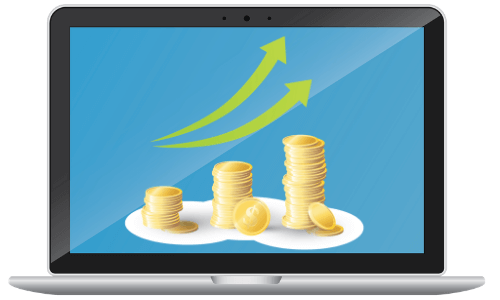 The cost of starting an online business are very low compared to any other kind of business. In fact, it is possible to get started completely for free. The platform that taught me how to create an online business is possible to join 100% for free without any commitments. I will show you in the next section how you can take this offer. If you are serious about wanting to create an online business, it can however be worth investing a bit of money at some point. The platform that have taught me have to make a full-time income gives you free access to the first 10 lessons, and you can stay a free member as long as you want to. If you want to really build your business, it is however worth investing in the premium membership. You can get it for as little as $0.98 per day, if you pay yearly, and that gives you full access and there are no hidden costs. I have tried many training platforms and programs online and most online programs cost several hundred dollars or even thousands for some basic superficial training. So it can become expensive to start an online business – especially if you go for the offers that promise quick money with no effort. They are usually just out to make money for themselves. But you can also get started for free and really get to test if it is for you without taking out your credit card. I will tell you a bit more about how this works below. There are MANY platforms and systems that promise to help you start an online business. There are also several good ones, but as I have already mentioned there are even more to stay away from, as they are not out to help you but just out to take your money. When I first started out, I did a lot of research and a lot of testing. I also failed several times. I actually started to think it was not possible to create a legit online income – it seemed that if a regular person had to create this without a huge budget, the only way was to scam people, and I was not interested in this. Luckily I eventually found the online training platform Wealthy Affiliate and decided to give it a chance even though I was very skeptical. This turned out to be a great decision, and it has taught me the skills to create a full-time income. If you want to learn to create an online income this is therefore my top recommended option for several reasons. Let me give you some of the biggest reasons why it in my opinion is the best way to start an online business. The core of Wealthy Affiliate is the step-by-step training. This is training that all levels can follow and learn from – even if you have no previous experience. The main training program consists of 50 lessons that will take you through everything from figuring out what kind of business you want to run online, how you can build an income based on your passions, how to build everything step-by-step, and much more. Example of some of the lessons you will get access to. In addition to that, there is another step-by-step training program with 70 lessons, there are new training posted by other members every day, and there is a live class with a new topic every week + access to all the previous live classes. The training you get here is amazing, and you can keep learning. The focus is on how to make an income with affiliate marketing, but there is also training about how to build many other kinds of online businesses. Also, you can use the skills you learn and take your online business in any direction you want to. I have for example also used the skills to get some great freelance jobs with local SEO and more. 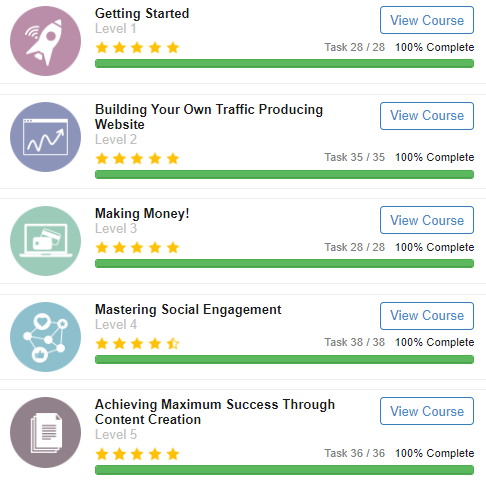 So definitely training I recommend, and I can say from personal experience that if you follow it and take action, you WILL learn amazing internet marketing skills. Included in the membership is unlimited support. Both from the technical support that gives quick answers, but also from a very helpful community of thousands of other successful online entrepreneurs. We all need help and support once in a while when we create and start an online business – here you will find all the help you need. If you join through the link on this page, we will even be connected automatically on the platform, and I will personally help you with any questions you have. In addition to the training, you also get access to some amazing tools. You get all the tools you need to build your online business without any extra costs. You get all the tools you need to get your online business started. 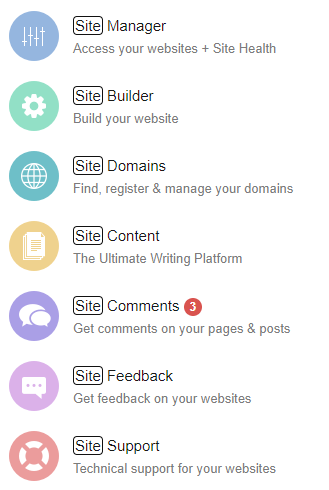 This for example includes super fast and secure hosting, keyword research tool, website builder, content writing platform, and more. As already mentioned, Wealthy Affiliate offers a free membership where you get 10 lessons for free and full access the first 7 days. This is unheard-of in this industry, and I have not seen any other learning platform where you can actually get such a thorough look inside without even taking out your credit card. After the 7 days, you can stay a free member as long as you want, or you can upgrade to premium. The first month will only be $19, and after that you can choose to continue monthly by paying $49 per month for full access or pay yearly for $359. This means that you the full cost of running an online business for an entire year can be only $359 – that is an extremely low starting cost for a business. In comparison I can for example tell that I recently tried another training platform. The normal joining price for that is $997. For this all you get is access to 2 hours of video training. Then on top of that you have to buy hosting for $49 per month and another tool for $99 per month. From everything I have seen online, Wealthy Affiliate is by far the best value for money, and it is amazing you can get started and test everything for free, so you can see for yourself if it is for you without any risks. This is one of the big reasons it is my top recommended way to start an online business. In addition to everything that is already at the platform, Wealthy Affiliate constantly evolves. They are constantly coming out with new tools, improvements, and training to help make it easier for you to run an online business. And the great thing is that it is not something you have to pay extra for. Once you are a member, you have full access to everything, and the price does not increase even though the platform is giving you access to cutting edge training and technology. As you can see it definitely is realistic to create an online business. You do however need to go into it with the right attitude and expectations. If you do this and are willing to make an effort, you will be one of the 10% that succeed. I have no doubt about this. Wealthy Affiliate is in my experience, without a doubt, the best place to learn to start your own online business. You will learn everything step-by-step, you will get all the support you need, you will get all the tools you need, and you can even get started for free. I have learned to make a full-time income by joining this platform so I know it works, and I will be happy to help you start and grow your business as well. Just click the join button above, and then I will see you on the inside and help you get started with the training and with building your online business. If you have any comments or questions, just leave a comment below, and I will get back to you asap.